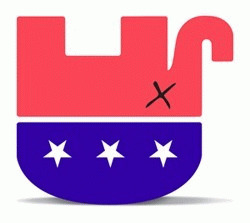 The Republican Party is dead! It just doesn’t realize it or have the decency to lie down and be dead. Working my way through college as an emergency room technician and a future failed pre-med, I learned the term “irreversible death.” It sounds weird I know, as if the term were an oxymoron, but it isn’t. A diagnosis of irreversible death results from death at the cellular level and is used in determining a gravely ill or injured patient’s prognosis. When a patient so injured or ill presented with the signs and symptoms of one or more of their body’s systems–brain, kidney, heart, digestive, etc.–in failure or had failed, from that moment, homeostasis was unsupportable and death was inevitable. Even successful treatment of the failing system would not stop the inevitable because the amount of damage in that organ or system would have begun to degrade some or all of the others at their cellular level. When disease or damage to the extent of being irreversible is diagnosed, no palliative, surgical, or transplant procedure could be done that would prolong the inevitable. A diagnosis of irreversible death is not easily made and had to be determined from strictly defined criteria. But, from the moment a diagnosis of irreversible death is made, it is just a matter of time before the patient expires. The Republican Party exhibits many signs and symptoms of a body politic with multiple systems in failure. Broken down into interacting parts, documenting the Republican Party’s ideology and actions at a cellular level in order to diagnose these failed and failing systems, I predict the inevitable and irreversible death of the Republican Party. In Part 2 of this essay I will expand my medical analogy by discussing the Republican Party’s genetic components that substantiate the notion that conservatism is a disease. I will unambiguously define many of the “signs and symptoms” of this disease that are causing the irreversible death of the Republican Party. Then, I will make a “practical” case for the destruction of “Brand Republican.” Numerous examples exist in business and marketing that demonstrate the power of brands, how brands can be damaged, and what happens when those brands are irreparably and irreversibly damaged. The end result for Republicans is that disillusionment, defections, and a resounding turning away from the Republican Party values will result in its inevitable relegation to the dust bin of history just as were the Whigs, the Bull Moose Party, and other fringe political federations. Systems are defined as interacting or interdependent items forming a unified whole.1 Together these interacting items act in concert to serve a common purpose, to influence the functioning, the life even, of the entire organism, entity, or in this case the Republican Party. For this essay I will consider the values demonstrated and documented by Republicans witnessed through their social, economic, and political practices. The signs and symptoms of multiple systems in failure that have so corrupted, diseased, and damaged the Republican Party–including its conservative ideology–make prediction of its inevitable death as certain as diagnosing a patient with inoperable metastasizing pancreatic cancer, severe trauma, or Alzheimer’s disease. The etiology of irreversible death of the Republican Party can be traced back to President Richard M. Nixon. The most famous symptom was articulated by John W. Dean when he told President Nixon that, “there is a cancer on the presidency.” Then followed the Watergate hearings and ignominious resignation. The cancer of that Republican presidency metastasized during the presidency of Ronald Regan. Dennis Kucinich stole my line! Sarah Palin missed her calling . . . she's a good actor.